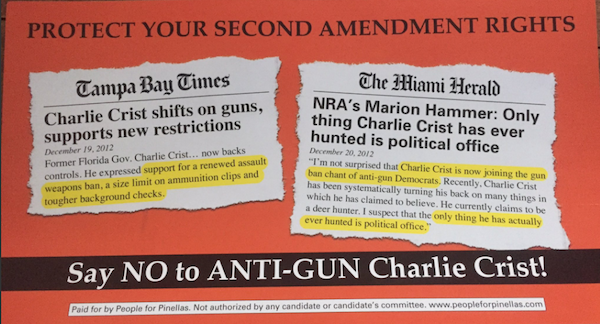 Don’t trust Charlie Crist to protect your Second Amendment rights -- at least that’s what a new mailer circulating around Florida’s 13th congressional district says. The mailer, which is hitting mailboxes in Pinellas County, warns voters that Crist doesn’t support gun rights and has a liberal agenda when it comes to the Second Amendment, backing an assault weapons ban, a size limit on ammunition clips and tougher background checks. People for Pinellas, a Super PAC supporting incumbent U.S. Rep. David Jolly, is responsible for the mailer. The flyer also contains quotes from a 2012 Miami Herald article where the National Rifle Association’s Florida lobbyist Marion Hammer took a whack at Crist for flip-flopping on gun control. "I'm not surprised that Charlie Crist is now joining the gun ban chant of anti-gun Democrats,” Hammer told the Herald. “Recently, Charlie Crist has been systematically turning his back on many things in which he has claimed to believe. He currently claims to be a deer hunter. I suspect that the only thing he has actually ever hunted is political office." 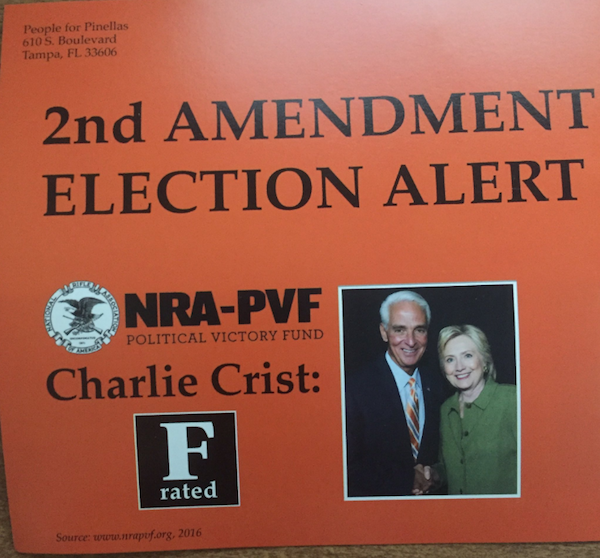 The NRA’s Political Victory Fund gave Crist an “F” rating this year, a grade which is reflected on the front of the bold orange mailer, juxtaposed next to a photo of a smiling Crist and Democratic presidential candidate Hillary Clinton. Things weren’t always this way for Crist, who at one point was a gun-toting conservative with close ties to the NRA. For years, Crist received the scores from the NRA that most conservatives in support of guns received. He voted strongly in favor of pro-gun policies. In 2006, Crist received the endorsement of the NRA and the Unified Sportsmen of Florida in his gubernatorial campaign. “No one has been stronger in support of Second Amendment, self-defense, and anti-crime issues than Charlie Crist and we sincerely appreciate your solid pro-sportsmen, pro-Second Amendment, pro-freedom record,” the NRA wrote in its endorsement. But as Crist’s policies shifted, so did his relationship with the NRA. He left the governor’s office in 2011 with an “A” rating, but later switched his party affiliation -- first becoming an Independent, then finally registering as a Democrat in December 2012. Crist rode the Democratic wave all the way to gun control positions, where he made a 180 turn. With a new party came a new set of eyes when it came to gun control, and this time, Crist decided he’d support Democratic stances on guns. He waded into the issue shortly after the Sandy Hook Elementary shooting in 2012. Spurred by the political discourse, Crist admitted he believed in limiting ammunition clips. Earlier this month, Crist called for expanded background checks at a debate at St. Petersburg’s Tiger Bay Club, a position he shares with Jolly. Crist, however, doubled down on his call to ban assault weapons, citing incidents like Pulse as reasons why military-style weapons must be banned. Gun rights advocates say despite the similarities between the AR-15 (the gun used in the Pulse shooting) and the M-16, AR-15s are actually semiautomatic, firing one round with every pull of the trigger, unlike the M-16, which is fully automatic. Charlie "The Windsock" Crist: caveat emptor. If these are weapons of war then no exemption should have been given to domestic law enforcement in the 1994 ban. “I...have common sense,” said Crist. “It is readily apparent to me as a common sense guy that more stringent background checks are absolutely essential to this problem...it is equally obvious to me that assault weapons should be banned. I don’t understand the need for assault weapons. Why we need to have weapons of war in the hands of our citizens...makes no sense.” Note to Crist (and all the rest of the dimwit anti-gun-rights crowd): The Second Amendment is PRECISELY about "weapons of war". What, Mr. Crist, do you think militias carry? Same EXACT situation will happen ALL across "the land of the free and home of the brave" if forced by corrupt and stupid politician like Mario Cuomo's stupid Son in New York. "MOLAN LABE !" Charlie "The Tuna" Crist ! Charlie "The Tuna" Crist ! You mean nobody yet has "canned" this moron who cost seven youth camp guards, a nurse and a medical examiner (and all their families) their livelyhoods and their futures, while at the exact same time "Charlie The Tuna" gave FIVE MILLION DOLLARS of taxpayer monies to the inmate's family BEFORE THE INVESTIGATION EVEN COMMENCED !!!! Yeah, "The Tuna" is for the "little people", just like Hillary "has been fighting her whole life for children, women, women's right to choose, toddlers", and other mythical things... If Charlie Crist takes a long walk outside the Tampa/St Pete area, he's just one more fake-tanned, anonymous, laughable, anomaly.